Bank holiday. Avoid the crowds or head out on the patch? A no brainer really, the boots are laced up, the binos packed and off we go! Lakeside for another go at ducks. Odd that there were no Goldeneye on my last visit (1/1/11). Flat calm today, therefore not good for sailing so I'm in with a chance. My luck is in this time and I quickly connect with a female a second before she dives. 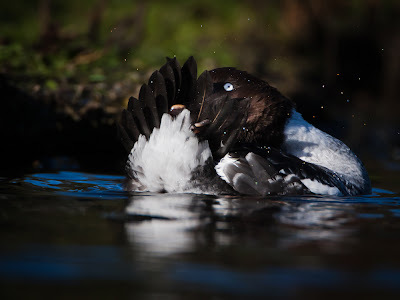 As the ripples widen from her dive a stunning male bobs to the surface. A few yards further along another pops up quickly followed by another.3 males and one female in all. Just 2 Red-breasted Mergansers on the far side complete the first leg of the patch tour. On to the beach and head towards Thurstaston. Plenty of people enjoying the last day of the holidays so the birds are distant. Shelduck sything through the top layer of mud. Curlew drift over, bubbling calls ring out. Black-tailed Godwits are spread all over the mudflats between West Kirby and Thurstaston. They are usually in much tighter flocks and concentrated closer to Thurstaston. There are Redshank and Knot feeding with them and the odd Dunlin bizzs about between long Blackwit legs. You can really see the size differences in body and leg between species and the feeding styles are obviously different when seen on display together. I give my wife a quick lesson on birding by character! Up the steps at Shore Cottage and pick up the Wirral Way in the direction of West Kirby. The south section will have to wait until tomorrow, when I have plans for an all day stay on the patch! I want to pick up some of the hedgerow species that were so reticent on NYD. Weather is brighter today and dry, but still cold. Plenty of Bullfinch in the blackthorn thickets and a Great Spotted Woodpecker undulates over Dawpool and on to the caravan site. Still no Mistle Thrush! Why am I bothered? I am not a mad lister. I don't know how many birds I have seen in my 33 years and 364 days ( I turn 34 tomoz - eek! ), and I don't keep lists by country visited etc. But I do enjoy a list of birds on the patch each calendar year. I don't need much of an incentive to get out but a yearlist can help! So I'm keen to see as much as poss over the next few days then I can start loking for the winter specials. 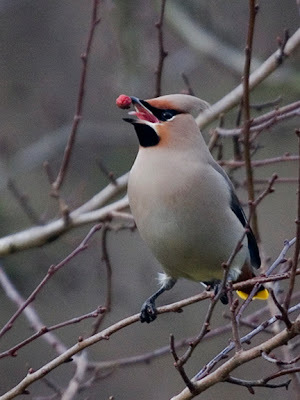 I fancy Waxwing over the next couple of weeks! A bonus for the list was a Goldcrest at the pine wood adjacent to Caldy Golf Course. These little rascals are regular on the Wirral Way, but have been hit hard by the recent sub-zero temperatures. Goldcrest and Goldeneye provided metallic bookends to a great afternoon on the patch. More patch manoeuvres planned for tomorrow!